Via Islam in Europe here is the section on anti-Muslim prejudice from the new Friedrich Ebert Foundation publication, Intolerance, Prejudice and Discrimination: A European Report (summary of the study here). After statistical testing, three statements were used to produce the anti-Muslim attitudes mean scale (Table 7, items 18 to 20). These cover the general impression that there are too many Muslims in the country, the charge that Muslims make too many demands, and broad-brush criticism of Islam as a religion of intolerance. Four further statements were surveyed in a random half of the sample. These cover a positive attitude that sees Muslims as an enrichment and the idea that there are great cultural differences between the majority society and Muslims, especially concerning attitudes towards women. We also surveyed the idea that Muslims generally support and condone terrorism. In most of the countries a majority believe Islam to be a religion of intolerance, with agreement just below 50 percent only in Great Britain and the Netherlands. In almost all the countries more than half of respondents said that Muslims make too many demands; Portugal was the only exception with about one third. The statement that there are too many Muslims in the country is affirmed by just over one quarter in Portugal and by about one third in France. In Germany, Great Britain, Italy and the Netherlands more than 40 percent of respondents complain that there are too many Muslims in their country, in Hungary about 60 percent. Interviewees were also asked to respond to four further statements covering perceived cultural differences and supposed affinity of Muslims toward terrorism (Table 7, items 22 to 25). Despite correlating closely with anti-Muslim attitudes these items represent separate constructs and were therefore excluded from the scale measure. The figures for those who say that Muslim culture is compatible with their own range from 17 percent in Poland and 19 percent in Germany to about half the population in Portugal and France. A majority of more than 70 percent of European respondents find that Muslim attitudes towards women are incompatible with their own values. Overall in the surveyed countries about one third think that Muslims treat Islamist terrorists as heroes, although somewhat fewer believe that terrorism finds moral support in the Muslim community (ranging from under 20 percent in Germany and the Netherlands to nearly 30 percent in Hungary). 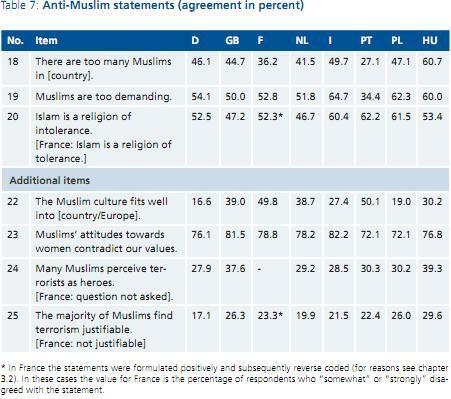 The scale created from the first three statements clearly illustrates the extent of anti-Muslim attitudes in the studied countries (Figure 5). It is conspicuous that Europeans are largely united in their rejection of Muslims and Islam. The significantly most widespread anti-Muslim attitudes are found in Germany, Hungary, Italy and Poland, closely followed by France, Great Britain and the Netherlands. The extent of anti-Muslim attitudes is least in Portugal. 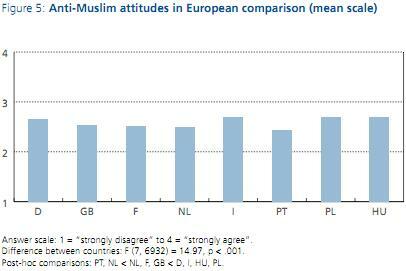 In absolute terms, however, the eight countries differ little in their levels of prejudice towards Muslims.